Approximately 12,000 homes in the RDN use onsite systems, often called septic systems, to treat wastewater. Septic systems are an effective wastewater treatment option when they are properly maintained. Maintenance includes, among other things, regular tank pump-outs, monitoring, and inspection. Upgrades and repairs should be done when necessary. Use our SepticSmart Kit and Brochure to keep your system working properly for years to come. Attend a SepticSmart workshop for a printed kit. For more information, check out the SepticSmart FAQs or read the SepticSmart Newsletter. Caring for your system starts with knowing where it is. 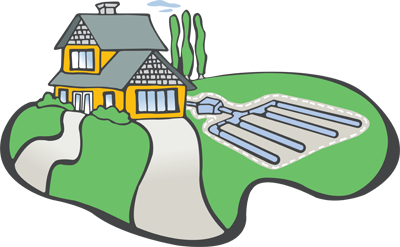 If you cannot locate your septic system site plan, you may be able to get records from your local Island Health office. Copies of Island Health's Authorizations to Operate may be stored at the RDN if records were submitted as part of an RDN building permit. Contact Building and Bylaw Services at 250-390-6530 for more information. If records are not available, contact an Authorized Person to locate your system. An Authorized Person is a Registered Practitioner (registered through ASTTBC) or a Professional (registered through EGBC). Septic systems generally require a pump-out every 3-5 years. Timing depends on the size of your tank, the number of people in your household, and your daily habits. On average, septic systems last 25-30 years. Proper maintenance has a significant impact on how well your septic system works and how long it lasts. Eventually, all systems need to be replaced. Onsite systems are regulated by the Ministry of Health and Island Health through the Sewerage System Regulation. Regulations require you to hire "Authorized Person" for most work on your system. Authorized Persons are defined under the regulation as Registered Practitioners or Professionals. ASTTBC maintains a list of Registered Practitioners. To find one in your area, call 604-585-2788 (local 236) or visit their ROWP Finder website (search under the "Island Health" Health Authority Region). EGBC maintains a list of qualified Professional Engineers and Geoscientists. To find one in your area, call 1-888-430-8035 or visit their website. Depending on the problem, an Authorized Person may (temporarily) convert your septic tank to a holding tank while repairs are under way. In this case, you may apply to the RDN for a reduction in septage disposal fees. A temporary rate of $0.01 per Imperial gallon is available to eligible applicants for up to 90 days. Click here for the application form. The Canada Mortgage and Housing Corporation provides a checklist of questions to ask and points to consider when purchasing a house with a well and septic system. The RDN offers free workshops providing tips on how to properly care for your septic system. Participants go home with a free SepticSmart Kit. The 2018 SepticSmart workshop series has now concluded, thank you to all who attended. Workshops were held at Gabriola Agi Hall(April 5, 2018), the Lantzville Legion (April 12, 2018), Nanoose Place (April 26, 2018) and Qualicum Beach Civic Centre (May 2, 2018).